Autumn has come to Salem, doorsteps full of pumpkins grinning lit, and lanterns, light blocked by the shrouds of cobwebbed netting. Ghostly blues and soft dove greys of the clapperboard houses gaze solemnly over the carnival atmosphere of the town. Those who tramp the streets, purposefully, in flowing black or purple robes, or wearing red horns, will believe my story is true but they are not reliable witnesses. They care more for the truth of witches than for the lies. Twilight steals up early by the harbour front. It seems to me that the tall, gabled, homes of the wealthy merchants in our town still submit to the expectation of the sinister and a black cat yawns, turns yellow eyes to stare at me, then it slowly crosses through my path. I turn towards the harbour, down the broad street. Above my head, a creaking signpost stops its sway as I pass beneath. The breeze holds its breath, the leaves no longer swirl, and nature stands to attention as I pass, in respect for what went before. There is the usual mist gathering around the seafront and I hear raised voices as those with the sight catch a flicker of my silhouette. I am a lone woman, modest in dress ,my head covered as our custom demands . My gown is red with a wide white collar. I have to starch it overnight and it can still feel damp by evening but that is no excuse. I remember the last time I was truly seen. It was at the witch trials.They took place behind closed doors. Twelve of my women friends, two were my sisters and five men I never knew, were all found guilty. I thought my heart would break when I heard they imprisoned Dorcas Good, she was only a child of four, how could she be suspected of witchcraft ? And again when I heard of old Giles.How Christian were these people who watched old Goodman Corey , a sure eighty years old if a day, watched him suffocate as he was crushed, pressed to death by heavy stones, for refusing trial. What happened to this place where evil was let flourish, but the evil never came from those accused of witchcraft. I wonder how long this other evil will last? I keep to the shadows, following the warehouses along the wharf, I look for one woman , a descendant of mine. I need to tell her that there is no tainted blood in her line and she should not be afraid of standing up for herself, even when the others are all against her. I need to help her, she is troubled .Worried for her unborn child. Some men, thought wise,have told her it should not be born. They have a learning today which makes them believe they know the future. No one can ever know the future, but many will guess. I turn the corner now down towards the harbour, the oldest seaport in Massachusetts’s bay. The wharfs and warehouses vague outlines in the disappearing light. Once I knew there was sanctuary for me in the gardens and quiet homes within yards of the harbour front, families who trusted my innocence kept me safe. Now they are stores with crystals and strange symbols in the window, offering services I have never heard of ‘Palm Reading’ , ‘Crystal Therapy’. They wouldn’t hold a sanctuary for me tonight. As the gloom deepens a low mist comes up from the harbour and unfamiliar outlines appear. I see a carriage with four wheels. And here is my Mary. The carriage stops and a man descends quickly. He looks young, he moves smoothly and holds up his arms , dropping a travelling bag, as he sees her. She moves more slowly, but looks happy to see him, hugging him close, her bulky outline pushing into him. I follow them through the streets and later, watch them mingle in the great hall of their hotel. I can also mingle, people are dressed in all manner of strange garments and if any of them can see me I won’t look out of place. Mary is amazed ,staring around, amazed, just as little Dorcas did the day they took her away. She doesn’t stare at me, although I will her to do so. I have no power. I never did.My eleven children never listened to me either, but at least that kept them safe. When they step out into the night, his arm around her shoulder, I go too. They stop before handpainted signs “ moonlight ghost tours” and “ graveyard visitations”. Noisy, disrespectful, tour guides, holding aloft tall pikes from which swing lanterns the like of which I’ve never seen. They are urging the people to follow for an ‘experience of a lifetime’. I could tell them what that really means. Mary is distracted, she still doesn’t see me but her attention is caught by young people dressed in black or scarlet or purple. Now women wear all manner of outfits. I think they are designed to draw attention rather than be overlooked, as we wanted to be. 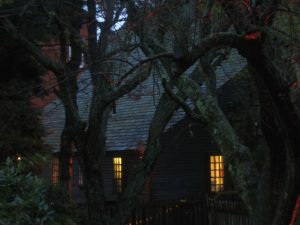 Here in Salem, tonight, all souls night, no one cares. I watch as they pay a guide and join a group for the promised ghostly experience of a lifetime. Mary still doesn’t look around and I can’t attract her attention, there are too many others. She seems scared to be left behind, not interested in wanding off on her own to explore. I think she needs the comfort of the group. Would she have followed the group leaders whn they proclaimed us witches or would she have been part of the scret group who helped and hid us? Now they are walking past the cemetery,stopping in front of the Salem witch trials memorial They hear a sad and nearly true tale of witchcraft trials and subsequent hangings. I move closer to the pillar bearing the names of those I knew and I find myself alone with Mary at last, only a few feet away from the group but still alone. Mary smiles tentatively. Now she does see me. Her smile is a very British smile, reminding me of my people back in Yarmouth. It’s a smile which is anxious not to appear rude but also not encouraging. She has turned her head towards mine. Her colour and plump healthy face are lovely to me, the women I knew then were pale , their teeth were bad with lips sore and cracked, just like mine. Mary, my great great granddaughter and then some . Can I tell her now? ” wait” she says” do you know me? tell me again. How did you know? They say my baby is deformed , they say it should not live. Their science must be true.”, before she breaks her gaze with mine I try again “ I came to help you Mary” I repeat, ‘Don’t always trust the science of learned men”. I turn away, slowly, knowing my image is fading and Mary, my bloodline and my hope, goes to rejoin the group. Entering the nearest hotel, he elbows a space for them to reach the place where beers are served. I watch her reach into her bag,reading the information leaflet from the tour. I see the colour drain from her face as she reads of a Mary Eastey, hanged on Burrow Hill, for witchcraft. Her hand is shaking as she passes the paper to her partner, refusing a drink, her hand going protectively to her belly. She speaks to him, I can’t hear what she says but as they both look out of the window, looking for me I believe. I see the spirit of their unborn child, fine and strong and I know that now they will keep it safe. Mary Eastey was hanged for witchcraft in 1692, as was her sister Rebecca Nurse. A mother of eleven children, her parting words to her family have been reported as “as serious, religious, distinct, and affectionate as could be expressed, drawing tears from the eyes of almost all present.” She was hanged along with several others and on the gallows she prayed for an end to the witch hunt. Mary Eastey’s last petition to the Court, of which it has been said that no more moving document has ever been addressed to any judge follows: “I petition your honours not for my own life for I know I must die and my appointed time is set but the Lord he knows it is that no more innocent blood be shed…..the Lord above that is the searcher of all hearts knows that as I shall answer at the Tribunal seat I never knew the least thing of witchcraft”. In November, after Eastey had been put to death, a young girl Mary Herrick, gave testimony about Eastey. She claimed she was visited by Eastey’s ghost, who told her she had been put to death wrongfully and was innocent of witchcraft, and that she had come to vindicate her cause. Eastey’s family was compensated with 20 pounds from the government in 1711 for her wrongful execution. Her husband Isaac lived until June 11, 1712.